J. Booth (active 1817). Artist associated with 1 portrait. 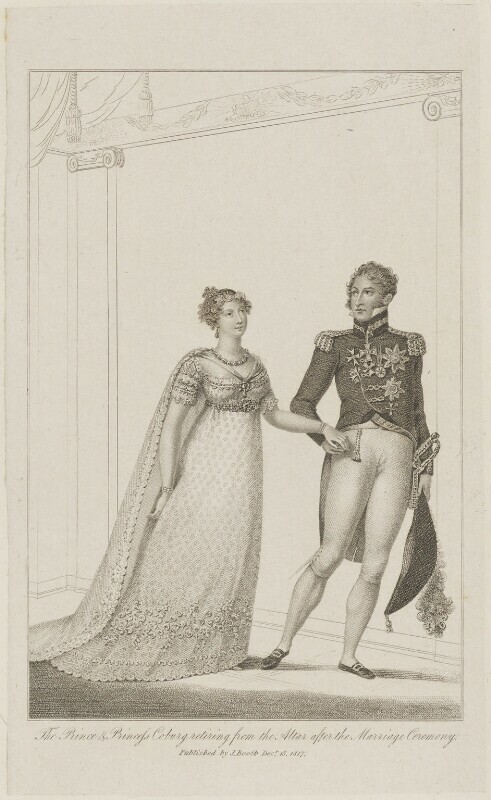 This stylised image presents an imagined view of the young couple in their wedding outfits the moment after their marriage on 2 May 1816. An earlier version with a slightly different inscription appeared as an engraving in the fashionable woman's journal, La Belle Assemblée, in June 1816. It serves as an indicator of their high fashion status as a modish, high profile couple, and their popular appeal. The nation's affection for them grew as their genuine love for each other became apparent.